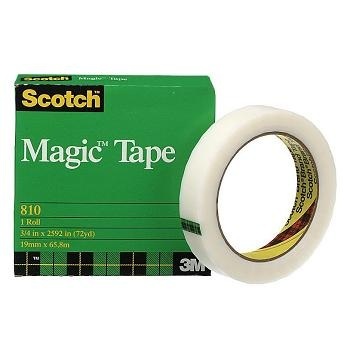 Premium invisible tape with the original matte finish that can be written on and will not turn yellow over time. It appears frosty on the roll yet is almost invisible on application. Smooth unwind off the roll and easy to tear. Photo safe. Ideal for use on documents. photocopies and faxes in offices, home offices and schools. 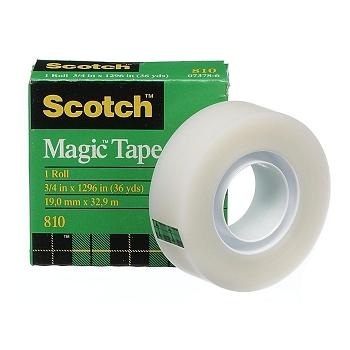 New lower price... 19 mm x 33m long rolls (small 25.4mm core) of Scotch® Magic™ Tape. It appears frosty on the roll yet is almost invisible on paper - will not shadow on faxes and photocopies. 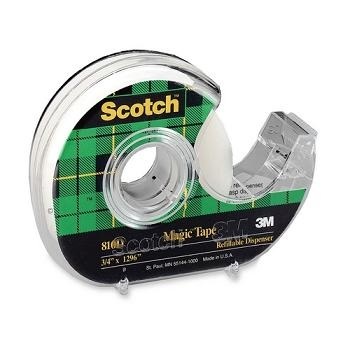 Suitable for use with small desktop tape dispensers. 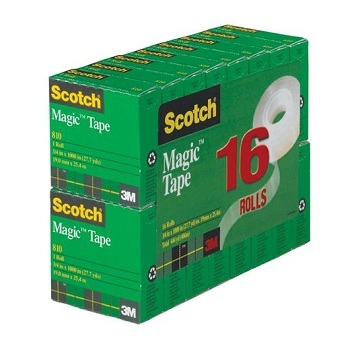 Individually boxed roll of 19 mm width tape. 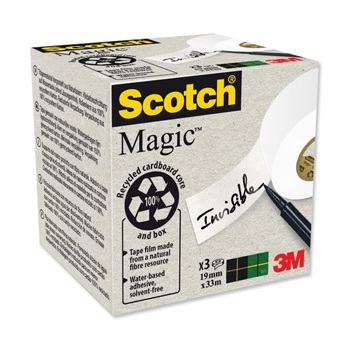 Buy in bulk and save with Scotch® Magic™ Tape Value Packs. 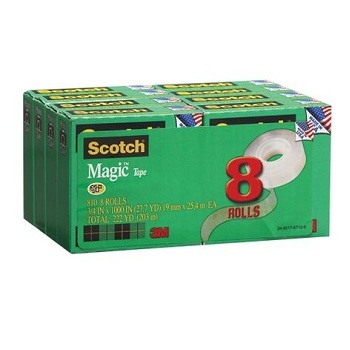 Value multi-packs are available in 4, 8 or 16 rolls. 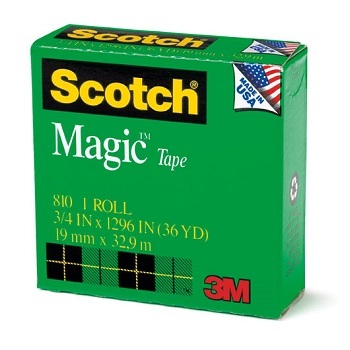 33m long rolls (small 25.4mm core) of Scotch® Magic™ Tape... the original matte finish tape. 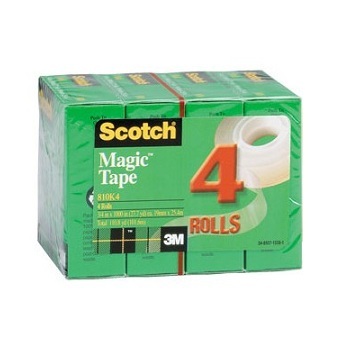 Individually boxed tape roll - Available in either 12 mm or 19 mm widths. Helpful hint: 19 mm is the most popular roll size. 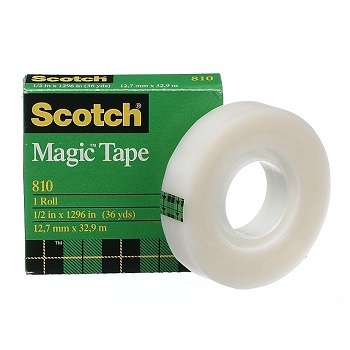 66m long rolls (large 76.2 mm core) of Scotch® Magic™ Tape... the original matte finish tape. Available in either 12, 19 and 25 mm widths. 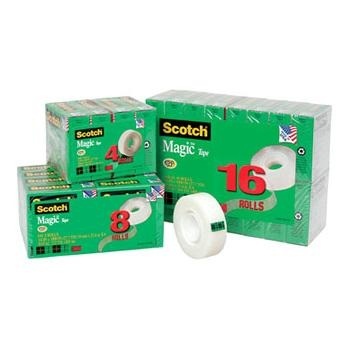 The best selling Scotch® Magic™ Tape roll size in a handy, refillable dispenser. Price each - Order 6 to receive one pack. 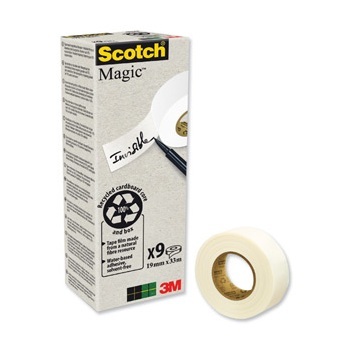 The Magic™ Tape you know and trust now available as an environmentally sustainable option. 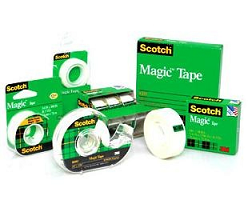 Tape film made from a FSC certified natural fibre resource with a solvent free, water-based adhesive. 100% recycled cardboard box and core. All rolls are 19 mm x 33m (25.4 mm core) - Available in packs of 3 or 9 rolls. 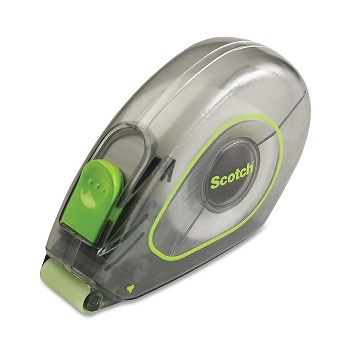 Provides the ability to apply variable-length tape, quickly, precisely and single-handedly. A sleek, stylish and easy-to-use design, the one-handed dispenser. 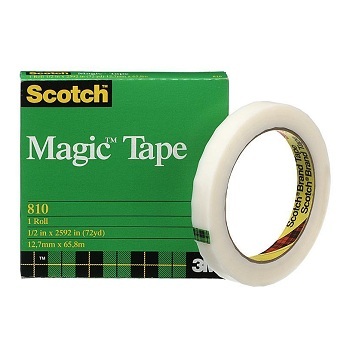 Comes pre-loaded with 19 mm Magic™ tape ready to use. 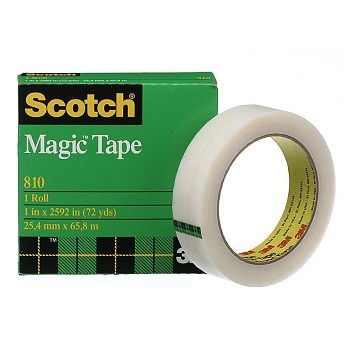 Refillable with 19 mm Scotch Magic™ Tape, Transparent Tape and Gift Wrap Tapes.